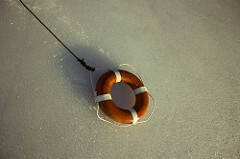 The Federal Deposit Insurance Corporation (FDIC) has now published four reports, spanning six years of research, that quantify how Americans are accessing banking and alternative financial services. The recently-released 2015 National Survey of Unbanked and Underbanked Households found that approximately 7 percent of U.S. households, a group roughly the size of the population of Australia, were “unbanked” in 2015, meaning they have neither a checking nor savings account. This is the lowest unbanked rate recorded since the survey was first launched in 2009, and a significant improvement from its peak of 8.2 percent in 2011. Progress has been unevenly distributed, however. Within the report lies a wealth of useful granular data, which when disaggregated reveal significant disparities between the national number and the higher rates found among lower-income households, communities of color, and people with disabilities. For example, Black households continue to be unbanked at nearly six times the level of White households, and Hispanic households are five times more unbanked. Without access to safe, affordable banking services, households are less able to save, build assets, and resist financial shocks, all factors that—according to recent research by the Institute for Policy Studies and the Corporation for Enterprise Development (CFED)—contribute to the growing racial wealth gap. 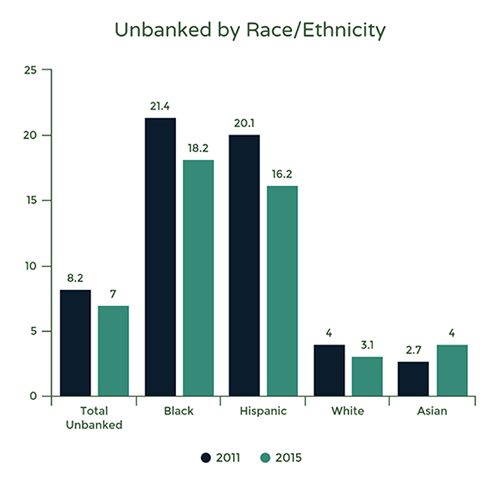 In addition, while the unbanked rates for Black and Hispanic households did improve slightly between the two most recent surveys (2013 and 2015), they increased significantly within the growing Asian-American/Pacific Islander (AAPI) community. But since data about AAPI communities are often bundled into a single racial category—even though they comprise a rich diversity of languages, cultures, and nationalities—it can be challenging to identify solutions that meet each group’s specific needs. The FDIC’s study confirms the findings of our 2015 Scrimping & Saving report, and underscores the urgent need for financial counseling and education in Asian-American & Pacific Islander (AAPI) communities. AAPI households are increasingly under- and unbanked, leaving them financially vulnerable because they often do not understand how to use or access mainstream financial services and products. National CAPACD reasserts our commitment to increase financial capability within our diverse AAPI communities, particularly by engaging culturally-relevant and intergenerational approaches. The study also strongly suggests that citizenship is a powerful asset for economic integration and opportunity. More than 20 percent of foreign-born non-citizen households were unbanked, while the unbanked rate for foreign-born citizens was lower even than that of U.S.-born households (4.6 vs. 6.1 percent, respectively)—a correlation that highlights the value of partnerships such as Cities for Citizenship, a national initiative which pairs support for naturalization with financial empowerment services, enabling legal permanent residents to build a strong financial identity alongside their new national identity. This year’s survey also studied income volatility, an important factor highlighted by the Center for Financial Services Innovation in the U.S. Financial Diaries project. More than one in five households don’t earn a steady paycheck, reporting income that “varied somewhat from month to month” or “varied a lot from month to month.” These households are far more likely to be unbanked than households with a steady monthly income—21.6 versus 5.7 percent—and more likely to use alternative financial services to access credit, such as payday lenders. And the most commonly cited reasons for not having a bank account in the report? Not having enough money, lack of trust in financial institutions, and high fees. This research from the FDIC provides municipal leaders, nonprofits, advocates, and the private sector with vital data about the state of financial access in the U.S., highlighting potential areas of need and opportunities for innovation. It can inform the development of new products, such as FDIC “safe accounts,” which make it easier for those earning low or uneven incomes to avoid paying bank fees. It can lead to the creation of youth savings account programs, such as Kindergarten to College, that provide universal access to an account that incentivizes saving. And it can bring together partnerships such as the Asset Building Policy Network, a coalition of the nation’s preeminent civil rights and advocacy organizations and Citi, which is committed to expanding economic opportunities for low-income members of communities of color. There is no simple answer to how we can reach more of these people, but valuable research like this enables us in the private sector to disaggregate data and identify trends, and can assist us in targeting the communities, products, and outreach that can lead to more financially inclusive communities.